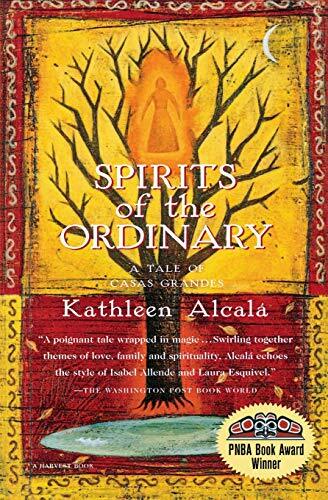 Spirits of the Ordinary, by Kathleen Alcala. Spirits of the Ordinary: A Tale of Casas Grandes, by Kathleen Alcala. Mariner Books (1998), 256 pages. A delightful book by a Chicana set in northern Mexico around 1900, full of unique characters, and touched with other-worldly magic and grace. Kathleen Alcala is a true storyteller, able to intertwine a variety of stories into one narrative. At the center is Zacarias, a man descended from Jews who had come to Mexico generations earlier, publicly converting to Catholicism to avoid being killed in the Inquisition, but practicing their faith in secret. Zacarias’ father continues to study Jewish texts, and his mother is mute but extra sensitive to the world around her. As the book begins, Zacarias is obsessed with prospecting for gold. He spends most of his time, and his wife’s money, in the mountains. When she cuts off his access to her wealth, he leaves on a quest for gold. Living among native peoples, he changes and changes the lives of those around him. Estela is Zacarias’ Catholic wife and the mother of their three children. When he leaves she has adventures of her own. Her mother has died, but her father is a successful merchant active in the community. In addition, Estela is the sister of strange twins, a boy and a girl so androgynous that no one can tell which is which. They also have a gift for finding water in the dry landscape. Additional minor characters, also unique, move in and out of the story. I especially liked the young woman posing as a man who travels through the southwest as a photographer. I have come to realize, finally, that my life’s work, whatever it has been called, is the act of translation. Not necessarily from one language to another, but between world views. I am a translator between worlds, between cultures, between jargons and contexts. And in trying to explain these many worlds to others and myself, I have become a writer. One of boundaries that Alcada transcends in her writing is that between the concrete, natural world and the magical or spiritual world. Her characters accept that life contains elements that need not be rationally explained. Folk tales blur into spiritual traditions. Judaism is a strong thread in the story, but not in ways that cause discomfort for non-believers. I enthusiastically recommend Alcada’s book for a wide variety of readers. Buoyant and vibrant, it is an enjoyable example of Chicana writing. ← The Floating Garden, by Emma Ashmere.